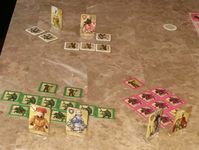 This session report is from a 2-player game of Fief using my variant rules available in the files section for the game (link). I hope it will show you how much of the 6-player Fief experience it captures. It only misses the betrayal and back-stabbing, which are impossible to capture in a 2-player version (but that can also be a good thing for some people!). The year begins with two families realizing that control of France is within their reach. Lord Henri the Loyal, with his loyal attendant Gauthier the Toll Collector, leads the Black Boars of the Plantaganet family, based in Sigy. Meanwhile, Lady Alienor the Persuasive and her loyal Spy Mathilde lead the Green Dragons of the Valois family, based in St. Gerome. In the first year, Henri expands his support by enlisting Eric the Ambitious to his cause. Lady Alienor struggles to persuade any other lords or ladies to join her quest because she is too busy learning the intricacies of how the Church selects Cardinals, knowledge that will come in handy in later years. Henri woos support from the Pink family in Blaye, led by Mireille the Ugly. Alienor does the same with Blanche the Fearless who leads the Yellow family from Chateauneuf. Both families also build goodwill with Charles the Cunning's Blue family in Bourg. Everybody ignores the much maligned White family of Gauvin the Coward, who spends most of his time herding sheep in the sleepy village of Tournus. Henri's army quickly takes control of all the villages in the Fiefs of Sigy and St. Paul in the southwest of France, while Alienor's troops move less quickly with only one Lady commanding them in the southeast. The Blue family leans towards the Green Valois, while the Pink family leans toward the Black Plantagenet. However, their support is lukewarm and they are not willing to send soldiers into harm's way for anybody. The year is a quiet one, with most families growing their base of Lords and Ladies. A notable exception is the Green Valois, where Alienor continues to investigate how to control all of the Church's Cardinals. Eric the Ambitious, meanwhile, leverages his many connections to become the Count of Sigy. This year begins with Lady Mireille's Pink family strengthening their alliance with the Black Plantagenet family. The alliance is almost formalized in marriage, but Mireille the Ugly has insufficient money to offer a dowry and Lord Henri declines the marriage at the last minute. Lady Mireille, despondent about her chances for marriage, turns to militant religion. With Henri's influence, she is now feared throughout France as Mireille d'Arc. Meanwhile Charles the Cunning decides to back the Green Valois family and joins them in chasing Lord Henri out of the strategic village of Villeneuve. In 1432, Eric the Ambitious attempts to become King as the only candidate with a Fief title. His ambition notwithstanding, he lacks enough support to be crowned so quickly. It is at this point that Alienor's religious studies begin to pay off. She supports the new Pink Lord Thierry in becoming Bishop of the large 1st Bishopric, gaining significant goodwill with his family. She immediately uses her knowledge to have him declared the first Cardinal of France shortly after, gaining even more goodwill. Meanwhile, Lord Henri has amassed a small fortune from collecting tolls on bridges. The Blue family, at Alienor's suggestion, convinces Arsene the Thief to steal from Henri. Henri, however, escapes with his fortune intact by setting up a dummy target that is completely empty! Lord Henri uses his wealth to purchase a Cardinal title for himself after he elected himself Bishop of the 5th Bishopric. Sensing that war is coming, all families except the hapless coward Gauvin build their armies. Alienor's patient diplomacy, and a healthy dose of luck, lead to complete support from both Pink and Blue this year, as well as lukewarm support from Yellow. Having diplomatically isolated the Black Plantagenet, Alienor takes immediate advantage. She accepts a marriage with Lord Quentin the Extravagant of the Pink family. Then she helps elect Alienor's new partner Othon as Bishop of the 4th Bishopric. She again leverages her ecclesiastical knowledge to have Othon become Cardinal, and to successfully stand in elections for Pope. The armies of Mireille d'Arc, now under the complete influence of Alienor, join the Green armies to push west into Black Plantagenet's villages. Simultaneously, the Blue family is convinced to attempt a risky assassination of Lord Henri, who leads the only large Black army. Lord Henri luckily escapes, and then uses a secret passage to drive east with his army, an act of desperation since heavy rains stop any support from Black's home area (the 5th Bishopric). Taking advantage of his isolation, Alienor's Green army charges Henri from the rear. His army is destroyed and Henri the Loyal becomes the first Lord to perish in the struggle for France. In the final year of the struggle, Pink's Lord Quentin is sent into religious life to avoid his profligate ways, becoming Bishop of the 2nd Bishopric. With all of her support in the Church, and her own brother Othon as Pope, Alienor is able to elect Pink's Lord Philippe as King of France. Her alliance now sports 3 victory points, and is in control of the County of St. Gerome, where King Philippe would certainly anoint her cousin Henri (in an ironic twist) as Count this year. The Plantaganet Lords are unfortunately stuck far to the west, in Sigy. In a last ditch effort to stop the Valois, they convince Gauvin the Coward to raise up an army and to join his sister Lady Isabelle the Heartbreaker in an assault on the heart of Valois territory. However, becoming Countess entitled Alienor to upgrade her stronghold to a fortified city, and her marriage with Pink's Quentin meant the Mireille d'Arc force-marched her powerful army to help. Green Valois now had the newly titled Count Henri lead this coalition to destroy Gauvin's White forces, in a battle that led to his and Isabelle's grisly death. The Valois alliance with Mireille d'Arc triumphs and gains control over France for the centuries to come, and it didn't even take a hundred years. Really looking forward to my copy of Fief: France 1429 arriving so I can see how my alternate history pans out.